I have seen those before but it has been a while. I spent the better part of my lunch break searching through the pictures in the other link and I have to say I am excited about building a depressed mining camp where the company store was. Another good site to consider at is NAIL Browser 2 which is a Federal records site showing black and white images of LOTS of archival footage. Click on "federal archives" and then record number 245. This was a study by the US Navy (of all things) to review the deplorable conditions of bituminous coal camps in Southern West Virginia and around the country. My home county of Wyoming County, WV (Virginian Railway territory in the 1940s) is included in the "Mullens" and "Harmco" sections as well as others. Most of these photos graphically portray the difficult conditions that miners and their families had to endure and can give you some additional detail of coal camp dwellings. One detail left out of most coal country layouts is a slate dump or "gob" pile. Those of us from WV will agree that that they were a ubiquitous part of the landscape and are seldom modeled. I am eagerly watching your progress in this new layout and have been impressed with your work since the time of the early Walther's "Trainmaster" photos. Good luck in your research. Good news, the room remodeling is done to the point that I can start building the layout. I got the walls changed and painted and the ceiling a fixed up and looks as good as new. I still have the closet doors to install and the trim work around them to do but I can start benchwork and get the shelving built under the layout so I can restore some order to the room. I can also bring my workbench back in from the garage so I can start building stuff again. I started testing some different lighting and I think I have settled on track lighting with incandescent bulbs, that way I can use a standard dimmer to simulate night time. I am placing some blue bulbs on a separate circuit. On my former HO layout I had a valance, which worked well but it looked a little sloppy when someone would look up, you could see framing and wiring and fixtures. I wanted a cleaner,less cluttered look on this layout and the track lighting gives me that look, plus I can move lights around and make adjustments as I build, it is easy to and or move a fixture after scenery gets built if I have unwanted shadows or dark areas. The light valances also seem to limit the light to lighting just the space below them and they did not bounce the light around the room very much, which required me to have a lot of light, which made a lot of heat. Not having a valance seems to let the light bounce around the room a little more, so lights on one side of the layout will cast some light on the other side as well. I have set the lights 8" away from the edge of the layout so I don't get that "dark front" look you get when the lights are right over the models. with the lights being 8" from the edge I get some light on the viewing side yet the lights are still far enough in front of the operator that he will not cast as much shadows. I hope that by the end of November I will have some layout photos to start showing, maybe even the loop track running. Looking forward to more progress. Please post pictures at every stage! Now the room is totally finished. I found some trim in the attic that was removed from my bathroom when it was remodeled that I used to finish off around the utility closet. 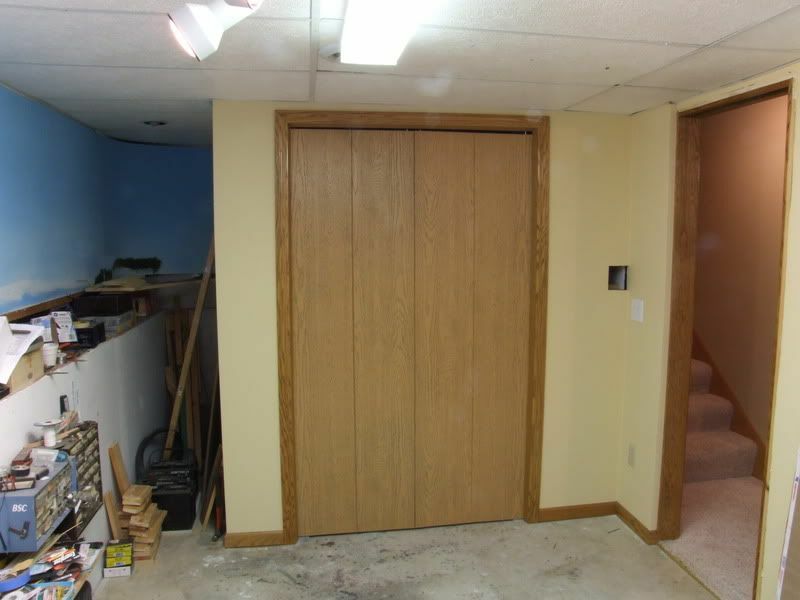 I picked up some really cheap prefinished doors just to get this project done fast, maybe someday I will swap them out for better ones, or maybe not, it is only my train room. I did not put the closet handles on yet because I thought it might be fun to put grab irons on the doors as handles, if I can find some. I wish I had finished the room off like this when I had built my HO layout, it makes such a huge difference. When the walls were not there I hated how cluttered it made my layout look and how loud and hot the room always was. I was always careful not to have the utility stuff show in photos. 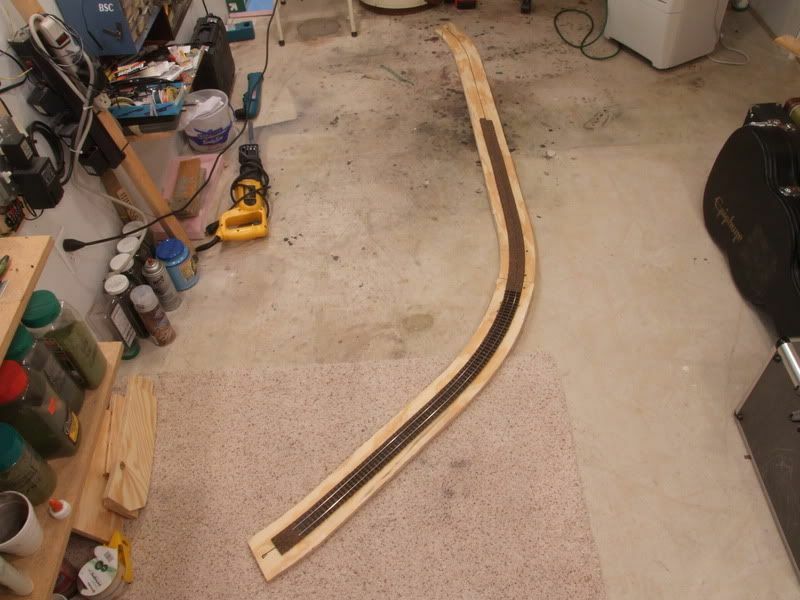 The lead photo in my Model Railroader article would have showed all the utility clutter had I not pulled out the Lift out section from another part of the layout and placed it in the back ground to block it all out. Here is the before and after photos. You can see in the after photo the square hole in the wall on the right side, that is where the running loop track will come through the wall and cross the doorway. The roadbed and track inside the closed is all in and tested. If you look to the left of the closet you can see the roadbed coming out of the hole on the left side of the closet which will go to staging. There is a light to the left of the closet that I did not have on so it won't be so dark back there. If you�re wondering why I left such a narrow little space between the closet and the wall it was not to gain layout space, I had to do it because there is a window that is covered by the back drop right there and I could not run the closet wall all the way across. Here is a photo of the roadbed going in behind the furnace, I had to build it and lay track on it first before I installed it. I kept the roadbed in two big pieces and I installed one from the right side and one from the left side, then I crawled back there and joined them together. 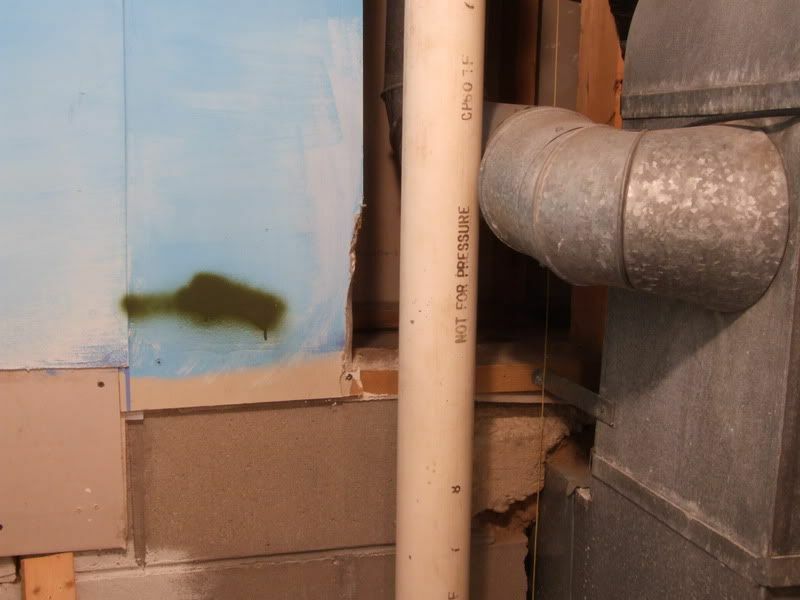 I had to bevel the stud on the left side to get a little more clearance between the soil pipe. I am still undecided what to do with the floor. I wanted carpet but this is also my workshop and I do a lot of metal working which would not go well with the carpet. I was thinking of painting it or vinyl tiles. Wow, what an improvement, nice work sir! thanks, sorry for such a messy room, with the layout gone I have no storage shelving to put anything on. Once I get some benchwork up I hope to get everything cleaned up. All those spots on the floor are from painting spills and stuff, my work bench used to be located just to the left of those spots, the spots would be about where I would sit. Those spots remind me why I can't have carpet around my work bench. 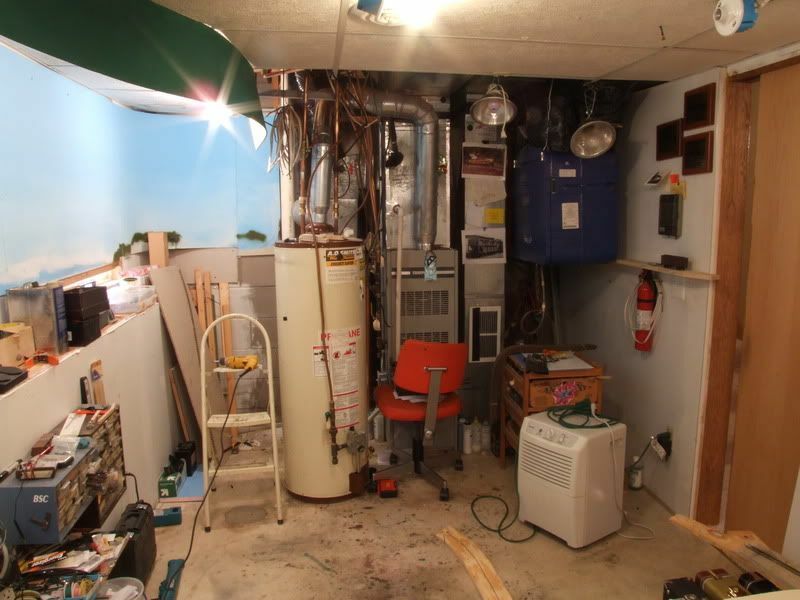 I couldn't agree more that the closing in of the utility area makes your room so much nicer. You will enjoy the planning i the future. Those spots remind me why I can't have carpet around my work bench. that I got free during one of the office re-arrangements where I work. The chairmat helps protect the carpet, and slightly increases the probability of finding microscopic parts that take flight. Looking good Jeff, nice to see the space getting a new face. thanks, sorry for such a messy room, with the layout gone I have no storage shelving to put anything on. Once I get some benchwork up I hope to get everything cleaned up. Oh I know exactly how you feel, going through the same thing right now with mess everywhere - building shelves and more shelves as we speak! Still making progress. the backdrop is in, still need to tape and mud it and paint it. 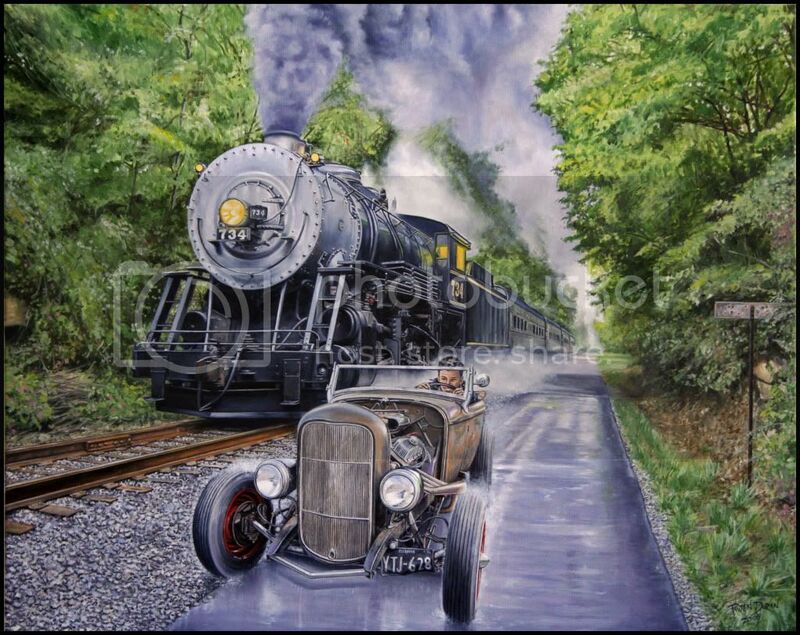 This time I am going to go for that hazy Appalachian mountian sky, not the bright blue I did before. 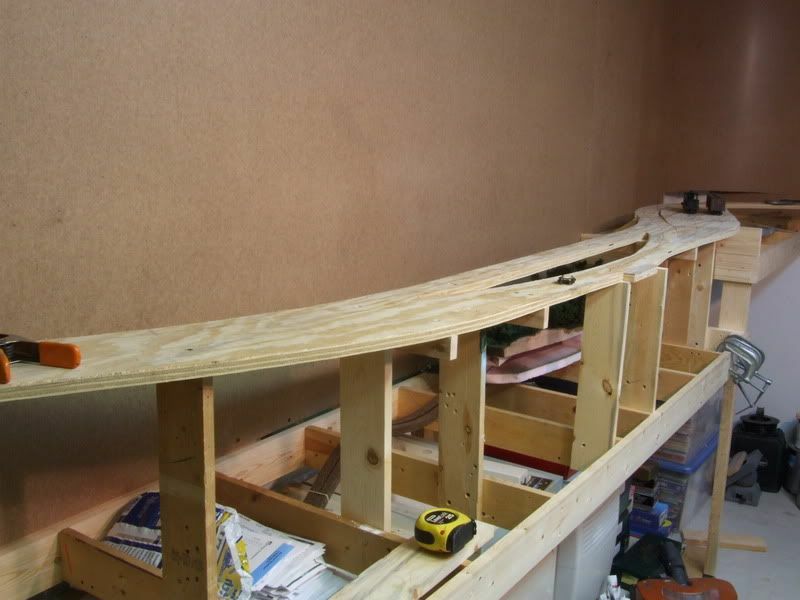 most of the benchwork is up now and almost all the lower loop roadbed. 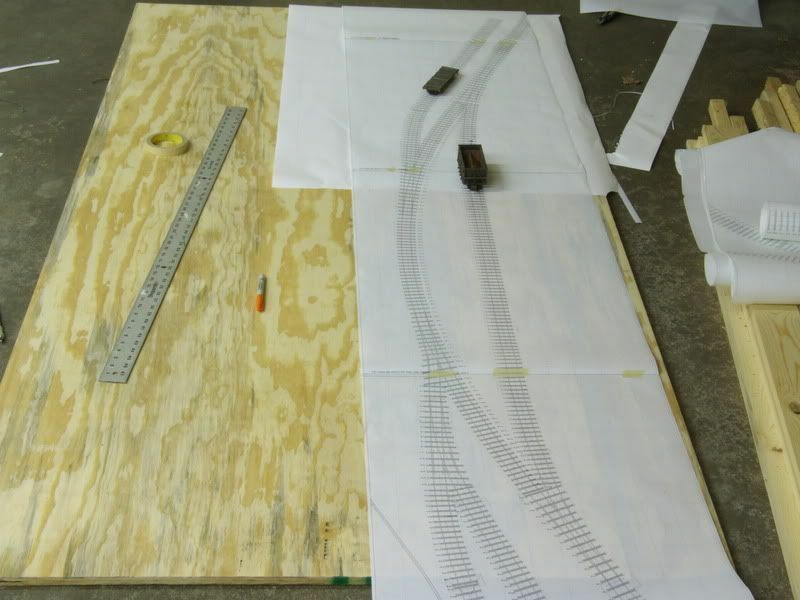 The roadbed is 3/4" plywood, which I cut out using full sized patterns that Bruce (racedirector) created for me using Templot from my Autocad drawing of the track plan. The Templot program is cool because it creates full size turnout templates that I can use to build the turnouts over at the bench and then install them on the layout, which makes for very smooth running turnouts and saves on the back. What else was nice about the full sized templates is that I could mark on the roadbed where the turnout throw bars will be so I could make sure that I did not install a riser there which would get in the way of my switch machines. I plotted the Templot drawings out on "D" sized paper which I taped together and laid on top of my plywood. Once the templot drawings were where I wanted them I taped them down and slid carbon paper under them and drew the edges of the ties and the center line of the track, making sure to mark the location of the throw bars. I never hurts to see what a few pieces of rolling stock will look like on the drawings. This also shows what the turnouts look like from Templot, pretty cool if you ask me. 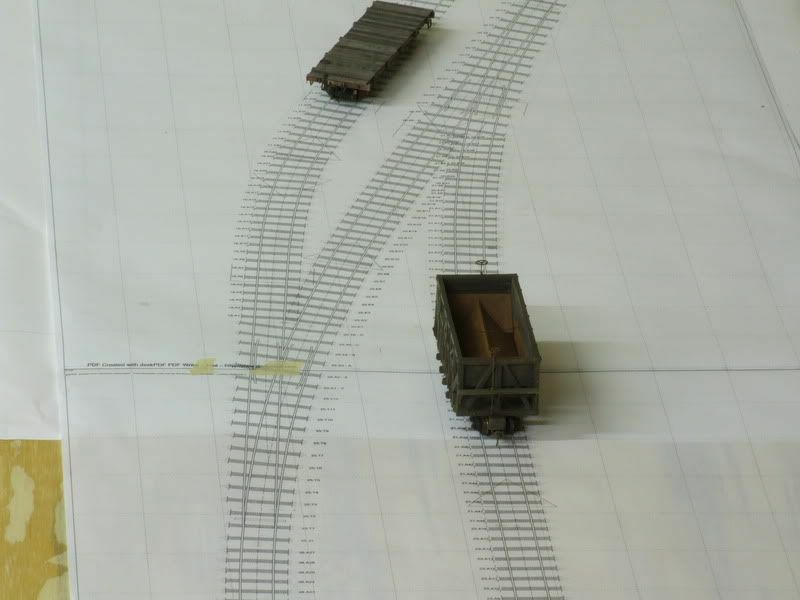 Here is that same section of road bed installed on the layout. This section of the layout will have the scenery fall off toward the backdrop all the way down to the base benchwork. the facia will be very tall on the front of this section of the layout and I decided to make some shelves, maybe with doors, or some rolling stock shelves just above the base benchwork. The two tall risers in the middle will help support the tall facia and a chute will be directed down between them to direct the dumped coal into a storage bin. I should have the backdrop in paint next week and then I will start getting some rail on the running loop down, after that I will tackle the roadbed up to the mine. Wow, excellent progress there my friend, you'll have a loop running in no time. Very jealous right now! Those Templot plans are so cool, aren't they?! I will never build another railroad without them, they just make things so much easier.